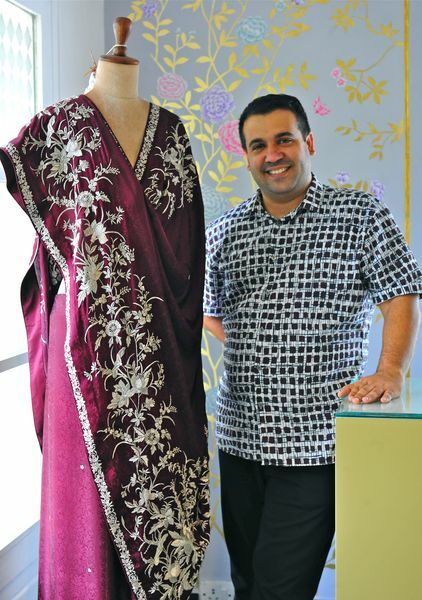 Parsi chic: Ashdeen Lilaowala with one of his creations. THERE IS AN AIR OF easy elegance and soft, balmy luxuriance about Ashdeen Lilaowala’s first flagship store. Located in a tony South Delhi address, amid high-end fashion boutiques, Lilaowala’s spanking new atelier has pink hand-painted walls with gold petals and chess-honed marble floors. There are cranes aplenty, embroidered into the array of Parsi gara saris, even inlaid in the stone steps leading up to the store. The 38-year old Parsi designer, seated on a plush off-white sofa with curved armrests, holds forth on the many mutations of the ancient textile pattern of paisley. In Iran, it is the cypress tree. The top part of the tree is very light; it moves and bends in the wind. “So if you see the Persian paisley, it is long and bent,” says Lilaowala. “If you come to India, the paisley resembles a mango, that is why we call it ‘ambi’. In China, it becomes a pot or an urn.” He glides over motifs transcending and evolving over cultural boundaries, as he talks about his travels to Iran and China in 2005-2006 to trace the origin and development of Parsi embroidery. Today, his fashion label, ASHDEEN, is at the forefront of bringing out modern, contemporary versions of Parsi gara saris, the most treasured heirloom in a Parsi woman’s wardrobe since the 19th century. The Parsi gara is often described as “Indian embroidery with Chinese origin and Persian heritage”. It is packed with fulsome floral motifs, intricately winged birds, Persian symbols, pagodas and “Chinamen”. How did it come to embody such diversity? The presence of Zoroastrian merchants in China, mainly for opium trade, is well-documented from the 18th century onwards. Many had settled in the Chinese port of Canton (modern-day Guangzhou). These Parsi settlers transferred oriental designs onto saris, which the Jeejeebhoys and Readymoneys brought back for their women folk in western India. Lilaowala recalls meeting one such family in 2005 in Shamian island in Guangdong province. They had seen the gara sari trade evolve firsthand. “They had so many saris with butterflies. When thread from previous saris were left behind, they would tell their craftsmen to make multi-coloured butterflies from it,” says Lilaowala. He has been injecting a more modern approach to the imagery of chinoiserie, flowers, birds and butterflies through his brand. His favourite remains the crane. There is one particularly resplendent number in jet black with a bevy of white cranes in a pool of red. This is also his most popular sari, retailing at Rs 60,000 apiece. “In Chinese culture and mythology, cranes represent peace and longevity. The Chinese were fascinated with flight,” Lilaowala explains his devotion to the long-necked bird. “Even in the most awkward positions, cranes tend to be flawless. This was one of my starting points and I continue to take it forward.” He launched his label in 2012 and initially worked out of his house. Lilaowala hopes Parsi gara saris will attain as definitive and ubiquitous a status as the prized kanchipurams, banarasis and chanderis. Mayank Mansingh Kaul, Delhi-based writer and curator who recently put together an exhibition in Jaipur on post-independence designers titled ‘New Traditions: Influences & Inspirations in Indian Textiles, 1947-2017’, featured Ashdeen’s “crane sari” as well. “Not only is Ashdeen interested in taking forward the idea of the classic Parsi gara using new materials, he has developed a signature style for Cocktail-evening wear which is refreshing,” says Kaul. “Ashdeen’s work is based on an interest in exploring histories of fashion and its evolving cultures.” Lilaowala has delved deep into Parsi weaving and threadwork, and contributed to many books and articles on the subject. Lilaowala grew up in Mumbai and was exposed to the illustrious gara tradition from childhood. Two elder sisters and a “very fashionable mother” powered his own sartorial intuitions. His years as a student of textile design at the National Institute of Design, Ahmedabad, further streamlined his interests. After graduating in 2002, he worked in Mumbai for a while before moving to Delhi for a research sponsored by the UNESCO Parsi Zoroastrian Project. (This took him to China and Iran.) He later did embroidery, from Delhi, for a Los Angeles-based company. When he designed a gara sari for a friend, he did not know that it would become his mainstay. That first gara sari led to many more. His first big showcase was at the Delhi Crafts Council in October 2012, followed by the Lakme Fashion Week. He now retails saris priced up to 03 lakh. He has draped Tabu and Madhuri Dixit with his intricate, handmade saris. Sonam Kapoor in Sanju was his latest Bollywood outing. “Styles may come and go and fashion is ever-evolving but classics like a gara are timeless,” says Anahita N. Dhondy, chef manager at SodaBottleOpenerWala. She wore her first gara sari when she was16, at her grandparents’ anniversary. She considers Lilaowala a pioneer who has revived and refreshed the Parsi gara idiom. “Parsi gara was not really of much interest to a non-Parsi for the longest time,” says Dhondy. “There was not enough spotlight and it was not readily available.” With stores like ASHDEEN, that is set to change.